Members of ARES were activated by the Thane Disaster Management Authority for communications at a fire at Mantralaya, India, in which two people died. The blaze broke out on the fourth floor of the Mantralaya building which houses the state secretariat in south Mumbai on 22 June, also injuring 16 people. The drama began with a call to Milind Korde VU2IZO requesting team members to assemble at Thane Emergency Operations Center (EOC). 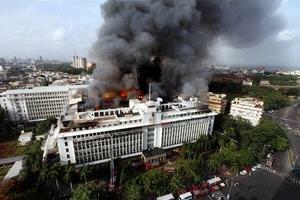 Emergency communications were established between EOC and the fire by Milind Korde VU2IZO and Parin Gangar VU2PIC. The following team members confirmed they were available at their home qth on standby with radio support were Jaiprakash VU2JPN, Satheesh Menon VU2WSM, Prahlad Bodke VU2TBV. Rohit Purohit VU2TOO and Nitin Ainapure VU2CAN attended the Thane EOC and activated the Emergency Station on Mumbai and Matheran Repeaters. The station was shut down after 10 hours when the fire was nearly extinguished.